Chrissy is a clear confirmation of the validity of saying "apple does not fall far from the tree." 18-year-old Bobbi Kristina Brown, daughter of legendary singer Whitney Houston, the paparazzi caught behind by inhalation of the powder. Reporters logical to assume that it's cocaine - what else can smell the powder of the daughter of one of the most popular drug in America? Bobbi Kristina Brown is well aware of the dangers of drugs: and her mother and father in his time were forced to undergo rehabilitation to get rid of cocaine and heroin addictions. And more than once. Chrissy's ex-boyfriend, made scandalous photos, argues that the star's daughter is also addicted to cocaine, and as he told the press, the first drug she tried together ... with Dad and Mom! "I tried to stop her, but she said: 'I say, is the same as my mother - confessed ex-beau Christine. - Whitney must know that her daughter is doing with them. If Chrissy does not stop in the near future, it addiction to cocaine will kill her! ". 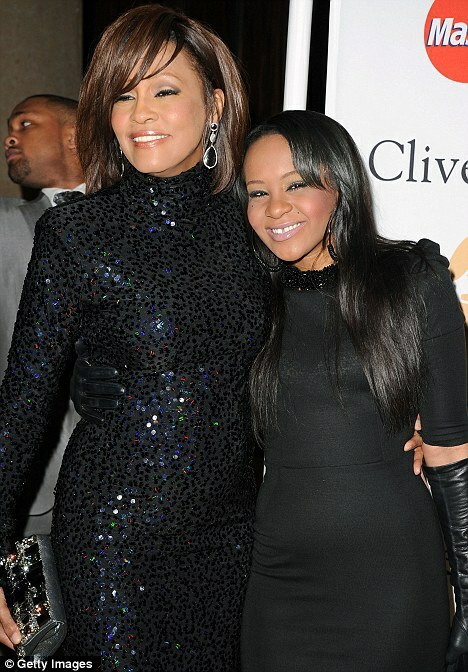 Christina, the only child of Whitney and Bobby Brown, celebrated its 18 th anniversary recently - last Friday. In the photos as she is only 17 years old. The photos were made in the home of her friends in Alpharetta in Georgia, where she lives with her mother. The journalists National Enquirer claimed that the girl regularly using marijuana, drinking beer cleaner every trucker on vacation, but also a great lover of drink Everclear, based on - Grain alcohol. On one of the parties, according to a former boyfriend, Chrissy so dispersed, that began to kiss the first available man, incidentally putting the bottle of beer. It seems that this is not just another hog-wash: the ex-beau Chrissy says that this behavior of his ex-girlfriend has demonstrated throughout the two and a half years that their relationship lasted. By simple calculation determined that to get involved in illicit substances and alcohol Chrissy started in 15 and a half years, if not sooner. The girl admits that the photo shows it, but argues that it is mounting. On his page on Twitter Christie wrote: "As far as shots - they made the once very near and dear to me man. He did so to make it look so than it seems. God will punish him." And she added: "But in fact this is not what it seems. People will do anything for the sake of money, which is very sad, and I was very hurt." According to Chrissy, with her former fiance, who sold the photos to reporters, the relationship was simply awful. "I loved him - and he liked the money - sadly, the girl says. - I learned this lesson." Chrissy added that her mother has her support that she needed: "Mom comforted me to the max, and I'm so grateful to her!". Yeah most of Whitney, the winner of the very large number of awards from all the singers in the world, in his drug addiction she admitted in 2002. True, the talk about what she used, the singer did not become. Replying to a question whether she amused cocaine, or, as it is called - crack, Whitney said: "First of all, let's clarify one thing. Crack is cheap. But I make too much money to buy it."